With numerous high-profile data breaches making headlines, 2018 was a terrible year for the cybersecurity world, and things are about to get a whole lot worse. Always going for the path of least resistance and exploiting larger attack surfaces than ever before, hackers are finding new and innovative ways to steal confidential data. Aside from the fact that digital data is now the most valuable commodity in the world, hackers have many more opportunities to wreak havoc. In fact, many are coming together to mimic the practices of legitimate businesses. Using the dark web, for example, they’re able to form alliances, trade malicious software, and sell stolen information with ease. It’s a proverbial minefield all over the country, but Los Angeles is especially dangerous. Because of the city’s international reputation, entertainment industry, and heavily trafficked port, LA is the 16th worst city in America for cybersecurity. If you operate a business there, here are some other stats that will help you spend your IT protection efforts more efficiently. Most data breaches stem from human error. After all, phishing scammers operate by exploiting the bad security habits of poorly trained employees. In other cases, something as simple as forgetting to install an important security patch can leave a system open to attack. Even more disturbing is that fact that over a quarter of breaches stem from malicious intent from within the organization. Among the most common insider threats come from former employees who leave the company on bad terms yet still haven’t had their access rights to mission-critical applications revoked. As the most popular communication protocol in the business world, it only makes sense that email is still the major delivery channel for malicious software. While modern email clients and services often have various security controls built in, they often lack the ability to reliably detect zero-day threats and social engineering scams. That’s why employees should always be mindful of opening attachments, especially if they’re unexpected or come from an unknown sender. Some data breaches are politically motivated, while others intend to cause disruption and little else. However, it shouldn’t come as a surprise that over three-quarters of breaches are financially motivated. It’s not just payment card information or bank account login details that hackers are after — it’s any kind of data that has value on the black market. This might include personally identifiable information, trade secrets, patents, or anything else that hackers can profit from at the expense of their victims. 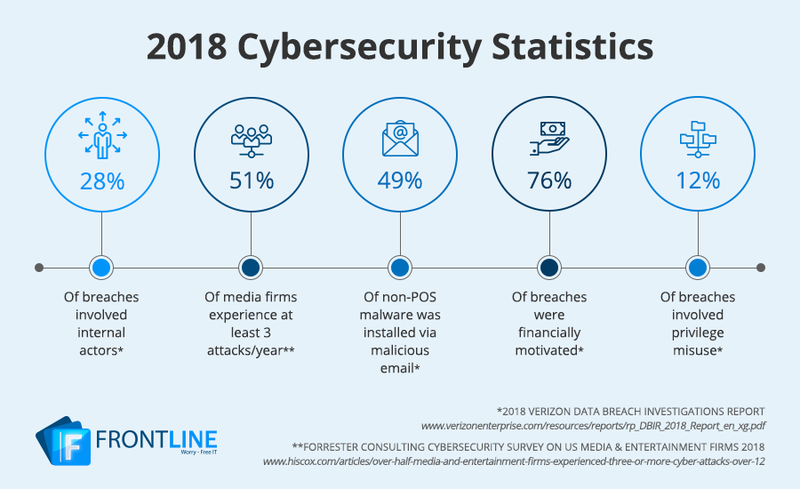 What makes this statistic even worse is that 79% of these firms were confident that their existing cybersecurity solutions would keep them safe. There’s no better example of this than when Sony Pictures, a company that presumably dedicates millions to protecting its intellectual property, was hacked in 2014. Although perpetrators of the hack obtained 47,000 Social Security numbers, what entertainment firms need to be the most aware of are the possibilities of losing control over their intellectual property. Hackers can make a hefty profit by stealing something like a movie, album, or TV commercial and holding it ransom. And since those are a media firm’s primary sources of revenue, the price of the ransom can be disastrous. Frontline provides worry-free IT services to organizations in Los Angeles. By partnering with us, you’ll receive the support and solutions you need to drive your business forward without the risk. Call us today to learn more.